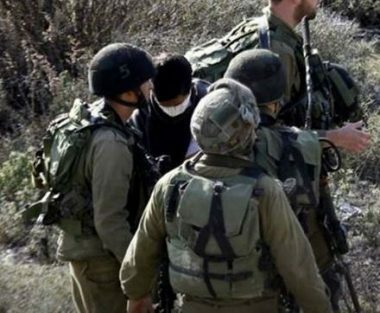 Israeli soldiers abducted, on Wednesday evening, three Palestinians from Hebron, and one from Bethlehem, in the occupied West Bank. Media sources in Hebron, in southern West Bank, said the soldiers abducted Majdi Khamis Rasras, 22, at a gas station in the al-Fawwar refugee camp, southwest of Hebron. They added that the soldiers also abducted Amjad Issa Hassouna at a military roadblock, south of Hebron. The soldiers also abducted Yazid Abu Rmeila, from the Salaima neighborhood in Hebron’s Old City, in southern West Bank, and assaulted his brother. In Bethlehem, the soldiers invaded the al-Khader town, south of the city, and abducted Ziad Yousef Mousa, 16.